The ICB Learner Portal is an important tool for all ICB students. This tool has been designed by the ICB to make every part of your ICB studies accessible and convenient. The portal gives you access to many different functions that you might need while you are studying your ICB course. What can I do Through the ICB Learner Portal? Making payments to the ICB. Every aspect of your studies with the ICB can be managed from within this space, which makes your studies that much more convenient. So how do you use this amazing tool? Lucky for you we’ve created this useful step-by-step guide. Here we will give you a complete guide to using the ICB Learner Portal – from signing up for the first time to registering for a course and more. You will find it all here. To get to the ICB learner portal you can either go to the ICB site and click on the Student Login link in the top right of the page or simply go straight to the portal page. Once you are there you should see the login panel. If you have already signed up you will be able to log in immediately. If you are a new student or want to sign up for a course you can click on the “register” button. Select whether you are already registered with the ICB or not. Choose the username you want to use. Choose the password you want to use. Choose whether you have a South African ID or a foreign ID (if you are not a South African citizen). Fill in your 13 digit ID number. Fill in your ICB Reference number (if you are already a registered ICB student). 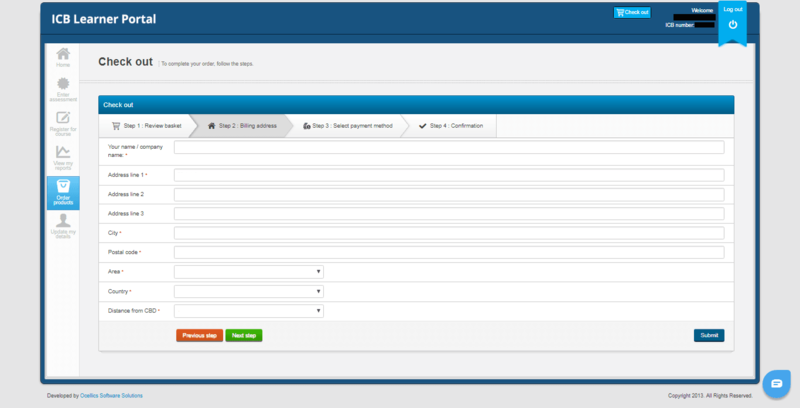 Once you have filled in all the information required you can click on the “Register” button at the bottom of the panel. Note: Your username can be your real name or any other name you choose. However, this name can not be changed once you have completed your registration. Once you click the “register” button, the page will change to the following. On this page and the next few pages, you will be required to fill in your personal information. You will only need to fill in the fields marked with a red asterisk (*). You will need to select your title, add your name, and your surname. Once you have added all the information needed you can click on the green “Next Step” button. On the following page, you will have to fill in a lot more contact information such as your phone number, your physical address, postal address, and billing address. If your postal address and/or billing address is the same as your physical address you can simply check on the boxes that says “Same as physical address” and the form will fill in the information automatically. Once everything has been filled in you can click on the “Next Step” button. Once you have selected all the relevant information you can click on the “Next step” button. You don’t need to fill in the city in which you matriculated, the area in which you matriculated, your postal code, or your municipality. These four fields are optional but all the other fields are required. 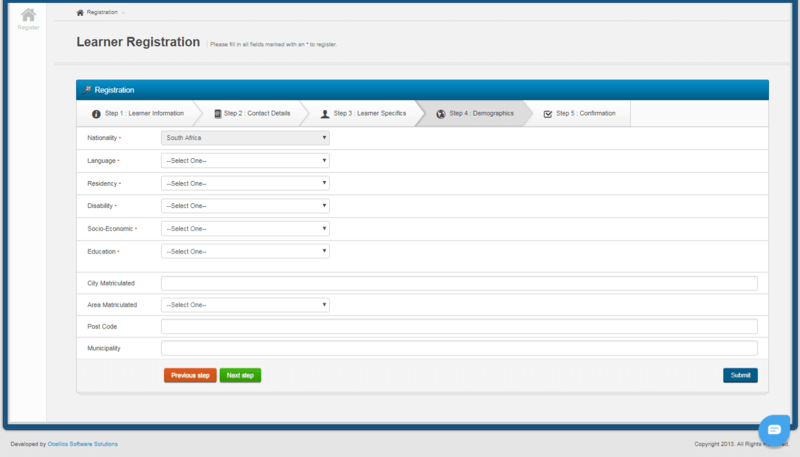 Once you have completed all the required fields you can hit the “Next step” button. On the next page, you need to check the box to confirm that all the information you have supplied up to this point is true and correct. Once you have done so you can hit the “Submit” button. When you hit the “Submit” button it will take a moment before returning you to the login panel. You can now log in with your new username and password. Congratulations! 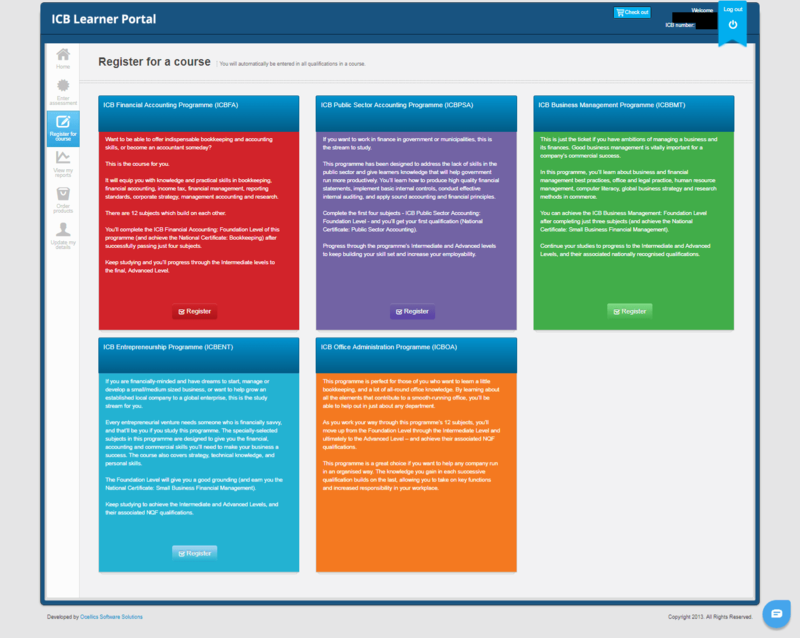 You have just successfully signed up to use the ICB Learner portal. 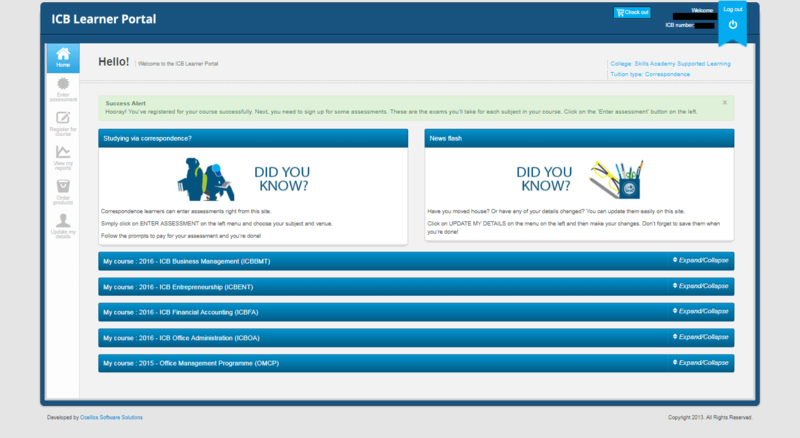 Now you can log in and make use of all the functions the ICB Learner portal has to offer. 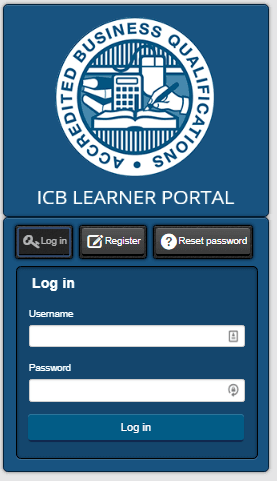 Once you have logged in you will be taken to the home page of the ICB Learner portal. It is important to note that this portal “times out”. This means that if you don’t do anything on the page for a while, you will need to log in again. This page is simply your entrance to the portal. You will find some news on the page as well as a list of all the courses you have registered for. You can click on each of the courses to get an expanded view showing your progress. Here you can register for your subject assessment dates and your closest assessment venue. On this tab, you can choose which of the five courses you wish to study as well as through which training provider you wish to study. This page lets you view information about your invoices, payments, results, and your certificates. Here you can “check out” and pay for all your subjects. There are several things you can do from this page. The “My Profile” tab lets you update the details you provided in the signup process. “Reset password” lets you change the password you have been using. “My activity log” lets you see everything you have done on the portal. Finally, “My vouchers” lets you see and use any ICB vouchers you have received. Click on the “Register for a course” tab. On the right-hand panel, you will get a list of the ICB courses with a brief description of each. If you want a more detailed explanation of each of these courses you can read more about them on the ICB Courses page. Once you have decided which course you want to register for, click the “Register” button. 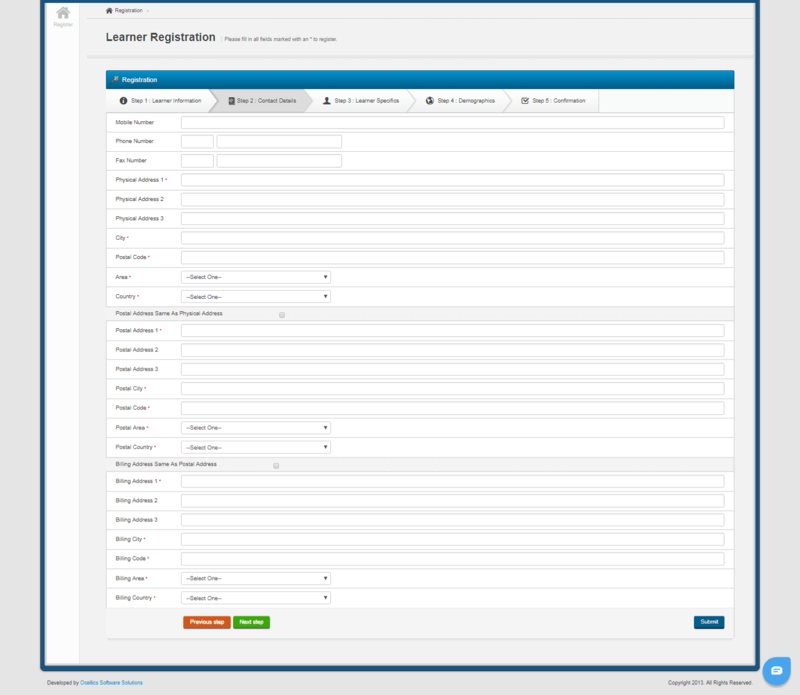 Once you click the “Register” button, a list of different training providers will appear beneath the courses. Scroll down and select “Skills Academy Supported Learning” from the list of providers by clicking the “Choose this provider” button. The page will load for a few moments so be patient. Once it is finished you will be taken back to the home page and you will see your course listed at the bottom. Once you have selected your course, click on the “Enter Assessment” tab. You will be taken to the following screen. Select the subject you want to register for. Once you have selected the subject and the venue you will see several options appear below that panel. These options are the possible exam dates for the chosen subject at that venue. Choose the date that suits you best. Once you have selected your preferred exam date you will see that the amount you need to pay will be updated on the right. Your annual registration fee per year is R350 and the fee for your assessments is R675. Repeat steps 6 to 10 until you have registered for all the subjects you intend to register for. Note: The prices mentioned in this article and shown in the images are correct for 2019 but are liable to change each year. Be sure to check the latest prices. Click on the “Check out” button. You will be redirected to this page. Make sure that everything is correct and then you can click the “Next step” button. On the next page, you need to make sure your billing information is correct. Most of this information will be automatically filled in based on the information you gave during step 4 of the registration process. You will, however, be required to fill in your name. If you are sure everything is filled in and correct you can go to the next step. These are the only methods that can be used to pay the ICB. Select the payment method and click the “Next step” button. This page requires you to check and ensure that all the information regarding the order is correct. Check the box to confirm that everything is correct and hit the “Submit” button. You will then be directed to the payment provider to let you complete your payment. Now that you know how to use the portal it is important to understand what the ICB is and what your options are. The ICB is the Institute of Certified Bookkeepers. This organisation has been around for 87 years already and is a professional organisation for bookkeepers of all kinds. The ICB offers accredited and recognised courses through a number of accredited training providers. You might think that the ICB only has accounting courses but you would be wrong. They offer a number of courses and all of them are focussed on business. This page will let you learn more about the ICB courses as a whole. Financial Accounting focuses on the business side of accounting. Specifically, it focuses on becoming a Financial Accountant. These are the people who analyse and collect all the data about every single transaction that a company makes. They will then create financial reports. These reports are shown to the public, investors, employees, and more. You can read more about these courses on the Financial Accounting information page. Entrepreneurship courses teach you everything you need to know about starting a business from scratch. For more information about the Entrepreneurship courses, you can go and have a look on the Entrepreneurship information page. Public Sector Accounting focuses on accounting in the government. A Public Sector Accountant investigates fraud, audits taxes, and helps to keep government, both local and national, running smoothly. You can read more about these courses the Public Sector Accounting information page. A Business Manager is involved in making sure a business functions properly and does not fail. Depending on the size of a company, a Business Manager could be involved in everything from hiring new staff to the training of the staff. Skills Academy has more information on these courses. You can find it on the Business Management information page. Office Administrators make sure that an office functions as well as it should. They perform a number of tasks which range from basic secretarial duties to ordering supplies and more. For more information about these courses, click the Office Administration information page. If you are interested in studying with the ICB then this guide is perfect for you. However, to simplify your course registration even further, you can call Skills Academy toll-free on 0800 39 00 27 and one of our skilled course consultants will help to make your life even easier! Call today!